As I'm sure you've heard, Craig Thornton's inimitable Wolvesden is moving. That's right, the City's preeminent underground chef will be on the up-and-up come later this year, his hand forced by the inevitable limitations of running such an ephemeral eatery. Ever since my first Wolvesmouth meal (when they were still being run out of Shaun White's house), I've always deemed it undoubtedly one of LA's premier dining experiences. As such, a return trip was certainly in order prior to the big move, and a private dinner hosted by longtime reader Paul Lee was a great opportunity to revisit. The evening got off to a robust start with an absolutely visually-striking plate of venison. The deer was about as perfect as you can get, with a great depth and complexity and an almost fishy flair (from the pine?) that I really appreciated--wonderful. Also fitting were the accoutrements: the earthy mushrooms were a natural pair with the meat, and I enjoyed the lightness imparted by the cauliflower as well. However, the best part was the incorporation of blackberry, blueberry, and raspberry. Pairing berries with venison is old hat by this point, but the use of the fruit in various forms here lent a sort of overarching, yet subtle sweetness that really worked. I loved how Thornton served what would typically amount to a final savory course as his first dish; to hell with the amuse bouche! 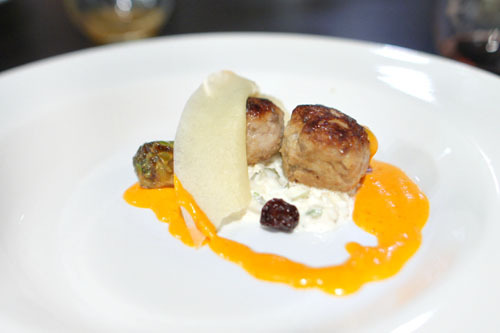 Wolvesmouth has always been a BYOB affair, and we took full advantage of that fact. As you can probably tell, I've been on a bit of a beer binge as of late, so I ended up contributing six bottles from my stash. 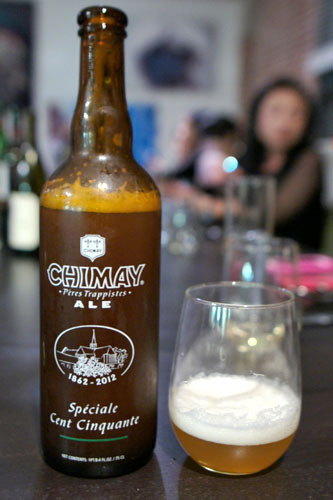 Starting things off was the Chimay Spéciale Cent Cinquante, which I imagine must be the brewery's first new beer in decades. It was made to commemorate their 150th anniversary, and 2,500 cases were distributed to only six states in the US, so this one was pretty rare. The beer did not disappoint, displaying a sort of Chimay White character, but with a spicier taste (from cardamom and coriander apparently) and a touch more hoppiness. An absolutely lovely tripel. In New American cooking, is there anything more clichéd than seared tuna (preferably sesame crusted)? Well, here, Thornton takes what could be a trite dish and turns it completely on its head. 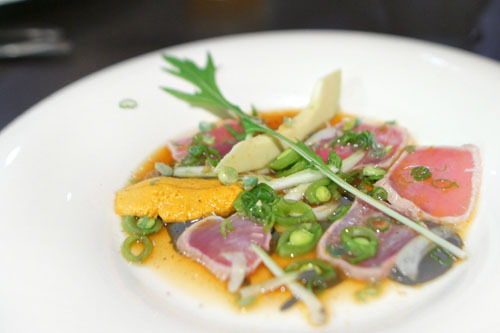 The fish was on point to be sure, but what really made this special was how the various veggies complemented the tuna, bringing forth a bevy of bright, verdant flavors and multifaceted textures, all tied together by that tangy ponzu. If that wasn't enough, the combo of urchin and avocado added a palpable lushness to the plate that played foil to the greenery, and I loved the crunch and sheer savoriness of those wasabi peas as well. The Chef then delivered a seemingly simple-looking plate that held another stroke of brilliance. I'm a bit of a broccoli fiend, so the course was right up my alley, offering it up in tempura'd, stalk, and puréed with lime forms--a real celebration of the vegetable. 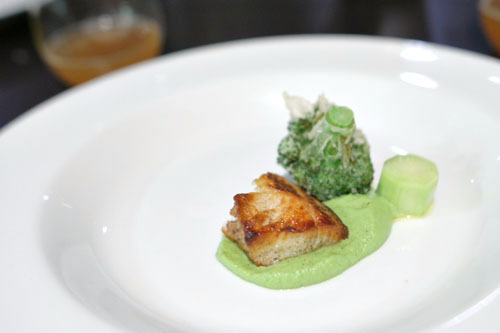 The fish, though, was just as inviting: supple and buttery, a bit fatty, and rather profound, it was probably the best bite of black cod that I've ever had, and fantastic when taken with the broccoli in all its guises. 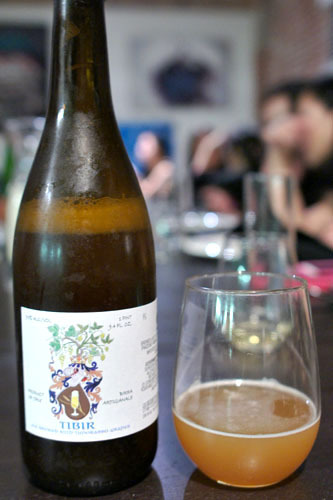 Our next bottle was an obscure Italian, the Birrificio Montegioco Tibir, an ale brewed with the addition of Timorasso grapes (used to make grappa) and aged in oak. This one was also to my liking, with its slightly bready, slightly funky flair and a delectably vinous character. Carrot and squash: usually not a good combination given my disdain for their sweetness. 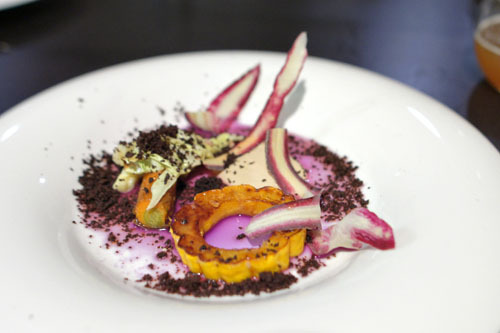 This dish, though, worked, and had the added benefit of being rather stunning to look at (loved that shade of purple). The key, thus, was the use of crunchy shards of cabbage to counteract the sugariness inherent on the plate--genius. It was a stupendous match-up, and I quite appreciated the enveloping astringency imparted by the cocoa-coffee crumbles too. With his "Swiss fondue," Thornton already holds the title for my favorite preparation of rabbit ever, but this dish is certainly a contender as well. Indeed, the meatballs here--all tender and juicy--were simply bursting with flavor; my mind was a bit blown given how much taste he was able to extract. I could've eaten a whole bunch of 'em all alone, but that would be missing the point, as that harissa was fantastic, providing just a light touch of heat and piquancy to go along with the meat. Let's not forget about the moderating effect of the crepe, and of course I was a fan of those pleasantly-bitter, cider-glazed Brussels sprouts as well. 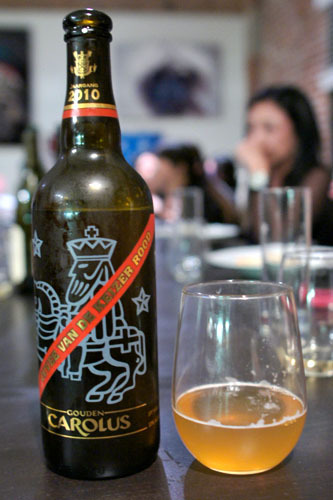 For our third beer, we returned to Belgium with the Het Anker Cuvée Van De Keizer Rood, a strong pale ale from Flanders that's only brewed once a year on the birthday of Charles V (February 24th). This particular example was of the 2010 vintage and managed to be a table favorite, showing off the essence of a classic pale ale, but with something extra that I couldn't quite put my finger on--sort of like a sweet, earthy depth that I adored. Potato and egg are two of my favorite ingredients, so this was sort of a no-brainer. The egg arrived perfectly poached, and when pierced, unleashed a torrent of lush, rich goodness into the velouté, forming a delectable marriage that was then accented by the saltiness of those wonderfully crunchy potato chips. I really appreciated the use of pea tendril here to add some lightness into the mix too, while the kiwi provided a bright point of tartness to things. Classic flavors, but done up Wolvesmouth style. 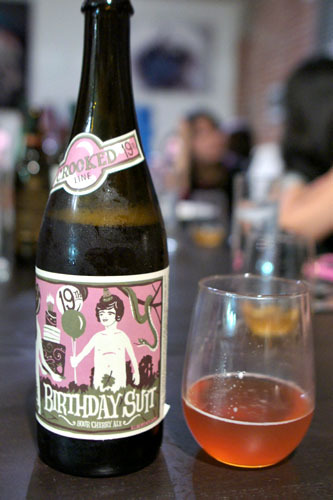 The first American beer of the night was the Uinta Birthday Suit, an ale brewed with cherries. It was easily the most polarizing drink of the night given its marked, puckering sourness and balance of fruity sweetness, all laced with a hint of earthy funk. 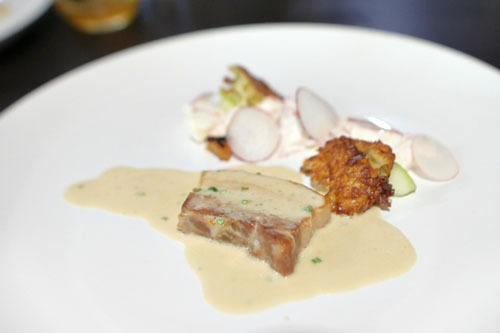 Thornton described his pork belly as "unabashedly savory" upon arriving at the table, and it was hard to argue with that. Indeed, the meat, a deft balance of lean and fat, conveyed all the headiness that you'd expect, but was further amped up by its accompanying lobster head sauce. The sauce, thus, also served to link the belly up with the fresh, sweet chunks of lobster on the side, and I positively adored those latkes as well--they were something that you'd just want a big plate of. 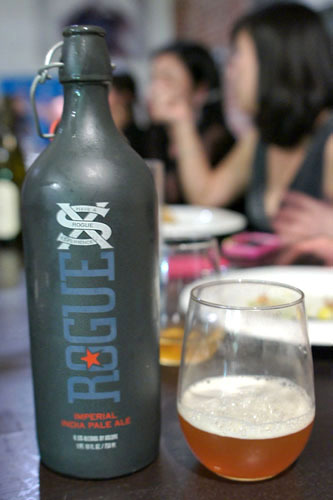 To pair with the heartier courses, I went with the Rogue XS Imperial India Pale Ale, a great example of the IPA style really, everything that you'd expect, with an apt balance between the hops and the caramel-y malt. Loved the ceramic bottle on this one, too. 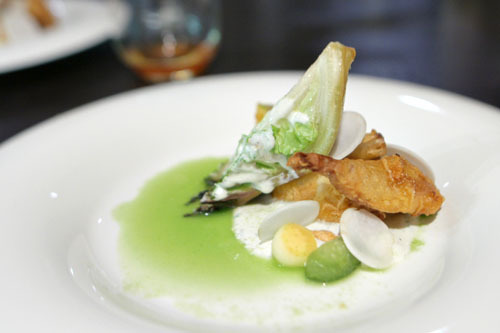 Rounding out the savory portion of our meal was this buttermilk-fried, cornichon-marinated quail. The bird I found full of flavor, tender and juicy on the inside but coated with a delightfully crisp batter, all while the blue cheese added a certain tanginess to the overall effort. The use of cucumber in two forms, meanwhile, contributed a nice balance to the dish, but even better that was grilled baby gem and its crisp bite and char bitterness. The final birra of the night, another hard-to-find Italian, was perhaps my favorite. 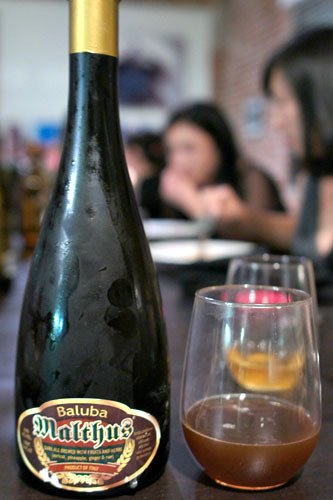 The Birrificio Di Como Malthus Baluba was something that I'd had back in 2009 at Sage in Las Vegas. I fell in love with it then, and the memory of the beer stayed with me throughout the years until I finally decided to seek out a bottle. A dark ale produced with apricot, pineapple, ginger, and rue, it wowed a lot of us at the table with its combination of saccharine, acidic, wine-like flavors and an almost effervescent levity. A bit esoteric, but utterly divine. Banana haters need not apply for our first dessert, which did an admirable job in showing off the fruit in various forms. 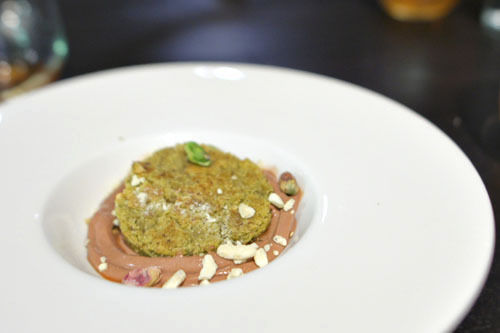 As prevalent as the banana was, though, it was never overwhelming, but rather served as a restrained base to the dish, working seamlessly with the nutty pistachio cake while the cajeta added a touch of sugary spice to the fray. 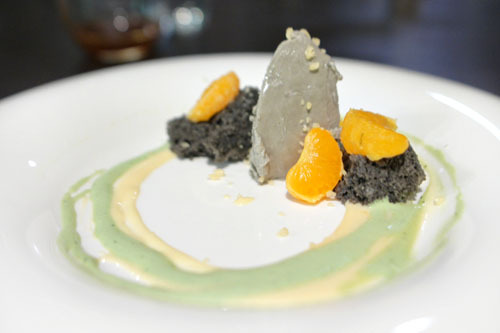 We concluded the evening with a course featuring one of my favorite dessert ingredients: black sesame. The sweet-yet-sorta-savory character of the sesame was flawlessly conveyed here, and I appreciated how it arrived into two forms. What really made this work, though, was its interplay with the tartness of the citrus fruit, making for a good mix of the sugary and the sour. Topping things off was a sprinkling of "pop rocks," which added a whimsical touch to the dish. 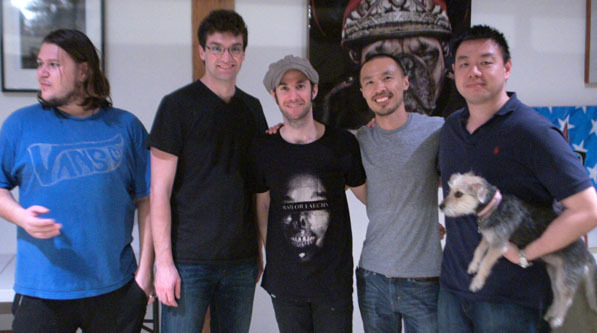 The current Wolvesmouth team: Andy, Shane, Craig, Caleb, Julian, Kimchi (dog). Not pictured: Bone and Paz. It'd been a while since my last Wolvesmouth dinner, and tonight just reminded me of why the place needs to be on everyone's radar. 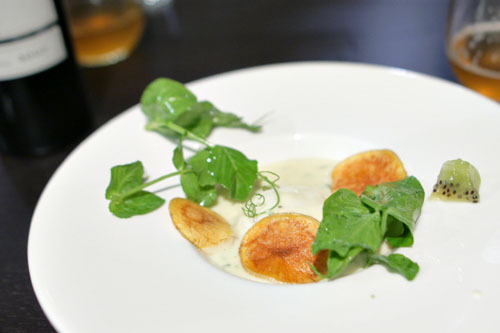 The food was delicious sure, but also unconventional, beautiful, and painstakingly precise, with a certain confidence, clarity, and vision that's hard to come by--Thornton's cooking has gotten even better. Nobody's doing food quite like him in LA, and that's a fantastic thing. As for his future place, it'll be a small, intimate spot, with maybe two dozen seats, one that'll allow the Chef to offer the type of experience that he's made a name for himself with. The restaurant will likely be located in close proximity to his current loft near Little Tokyo, and may offer a lunch/take-out component as well. Sign me up. Nice review Kevin. Love the platings on this one, and some nice originality in alot of the dishes. I like your beer selections too. Have you ever been able to get a hold of a bottle of Pliney the Younger? It's supposed to be one of the rarest and best IPA's out there. Great review! 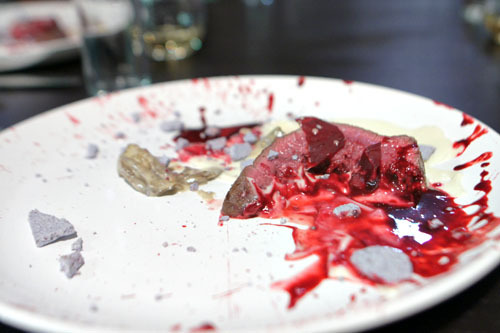 I had the pleasure of going to a Wolvesmouth dinner last month and was blown away. I hope to be invited again! Ate at Wolvesmouth on the 31st. Here is what my husband wrote...sums up the experience. Anon: Thanks. Does Pliny the Younger even come in bottle form? I thought it was only available from the keg. I've had it before, but I actually prefer Pliny the Elder. Anon: Wow. I think this is the first time I've seen a meal inspire poetry.